It’s no secret that I love to travel! 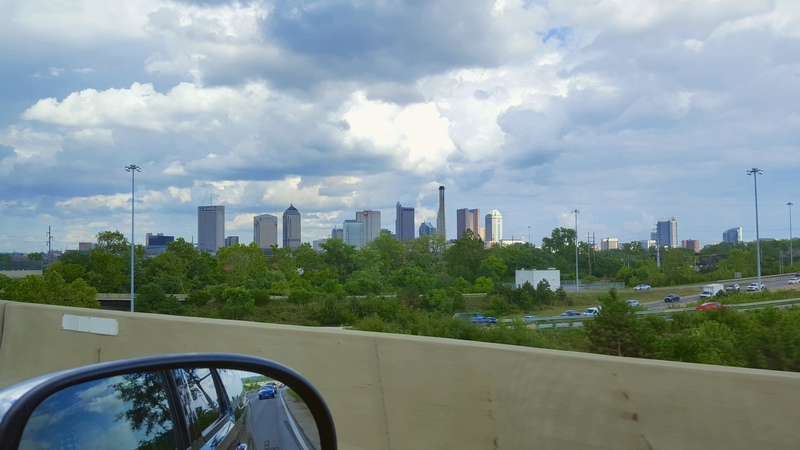 As much as I love to explore the world, I also love exploring my home city of Columbus, Ohio! 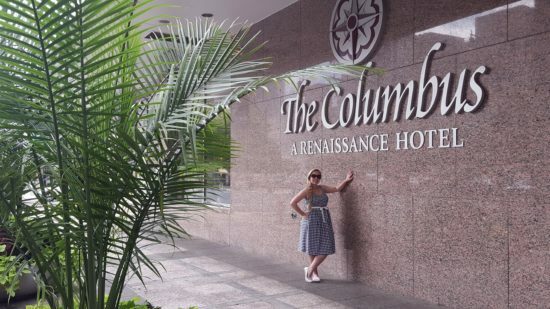 I often think of Columbus as the hidden gem of the Midwest, with lots of great restaurants and bars, a well-known arts and fashion scene, beautiful parks, relaxing hotels and a welcoming Midwestern vibe that has made Columbus one of the best cities in the United States! 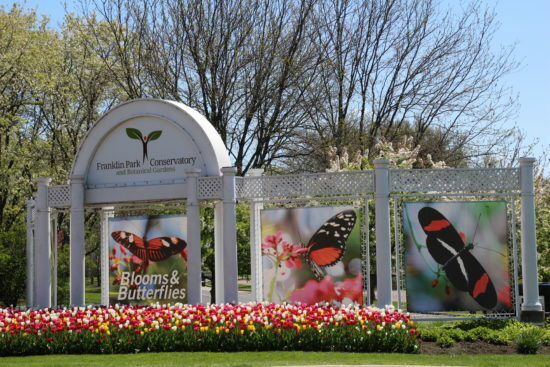 With so much to do and see around Columbus and its surrounding neighborhoods, you will definitely need more than one weekend to experience Columbus! 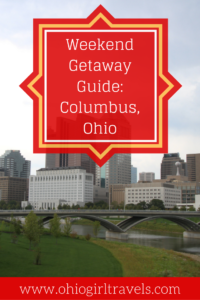 If you want to experience the thriving heart of Ohio, read my weekend getaway guide showcasing where to stay, what to do and where to eat and drink in Downtown Columbus! 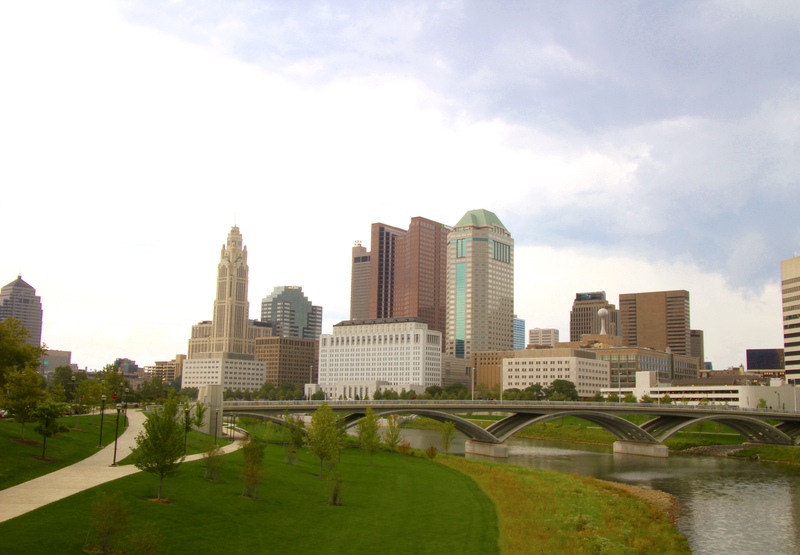 Established in 1812, Columbus is Ohio’s capital city. Ranked as the 15th largest city in the United States, numerous global corporations have headquarters in Columbus. Wendy’s, White Castle, Bath & Body Works, Express, Victoria Secret’s, Thirty-One Gifts, Nationwide Insurance and NetJets are a few of the major corporations that call Columbus home. Columbus has been ranked as the 3rd most fashion-forward city in the United States, ranks 4th in the country for craft beer production and constantly tops lists as one of the happiest cities in the United States! Columbus has even been ranked as one of the most intelligent cities in the world (both in 2013 and 2014) and was the only U.S. city in the Top 7! That’s pretty impressive for an unassuming Midwestern city that most people by-pass for a vacation destination! But for those that live in Columbus, we know just how awesome Columbus really is! 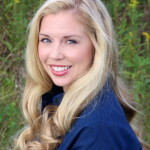 In fact, almost anyone you meet, who lives in Columbus, will gladly give you directions and personally guide you to their favorite Columbus hot-spot! I love this city, even though I may travel the globe, Columbus will always have my heart! Read why you’ll fall madly in love with Columbus, too! *Columbus is centrally located in the United States and is within 550 miles for more the 60% of the U.S. population! A flight to Columbus is usually under 1-2 hours for most of the central, midwest and eastern United States! 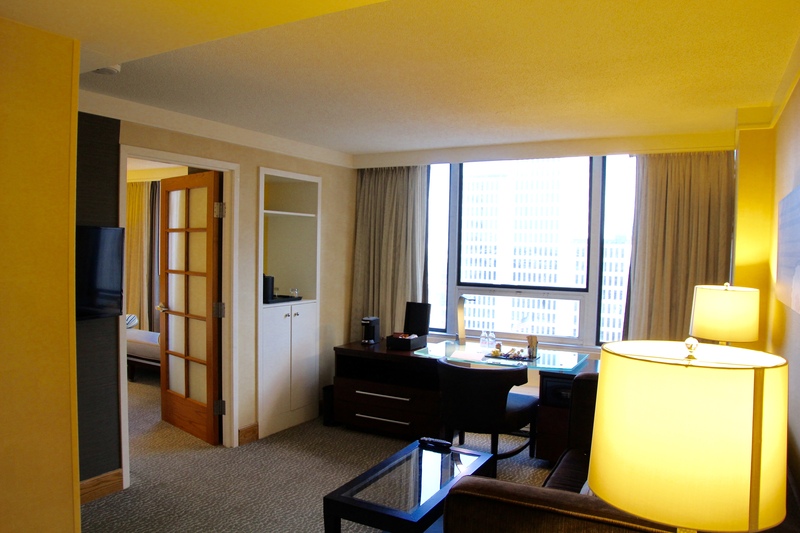 The Renaissance Columbus Downtown Hotel is located in the heart of the capital city. 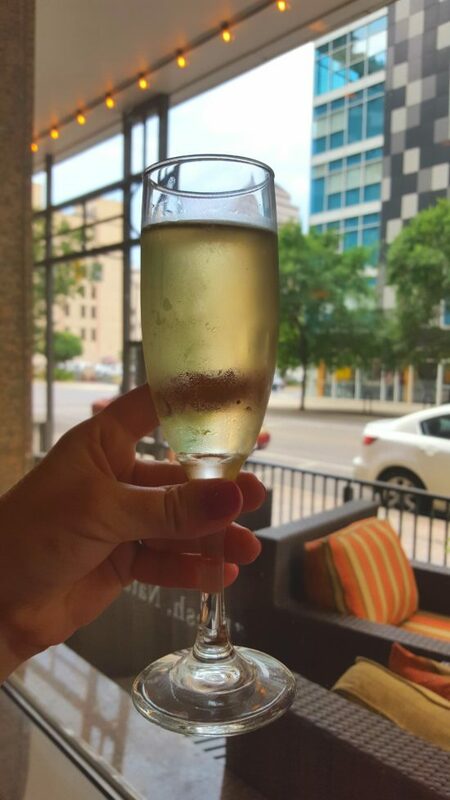 Located on the corners of Third Street and Gay Street, the hotel is easy walking distance to many great downtown hot-spots or you can take a quick cab ride, hop on the CBUS (free Downtown Columbus circulator) or rent a COGO bicycle to take you around to other favorite local spots. 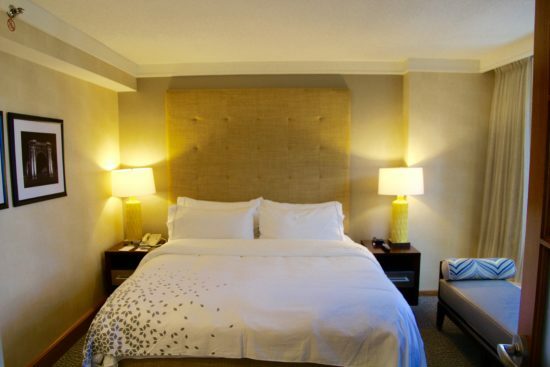 Newly renovated rooms at the Renaissance Columbus Downtown Hotel will make guests will feel right at home. With little luxuries like plush and cozy bedding, views of Columbus’ skyline, and welcomed comforts of home such as flat-screen televisions, work-space with well-lit desks, iPod docks, Wi-Fi, mini refrigerator, coffee maker and updated bathrooms, our room was a welcomed retreat for our “stay-cation” weekend in Downtown Columbus! 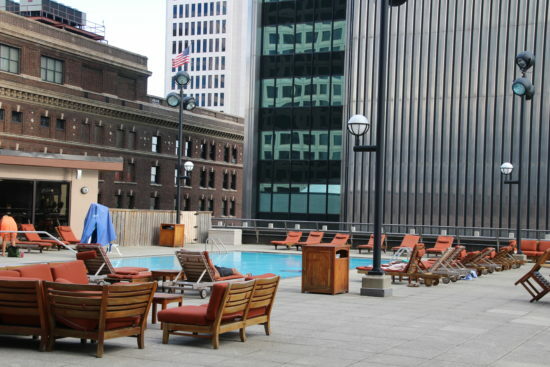 Along with a great location and cozy rooms, the Renaissance Columbus Downtown Hotel offers guests lots of amenities such as an inviting rooftop pool to lounge by during the warmer months, a fitness center and a restaurant and bar, Latitude 41 and Bar 41. 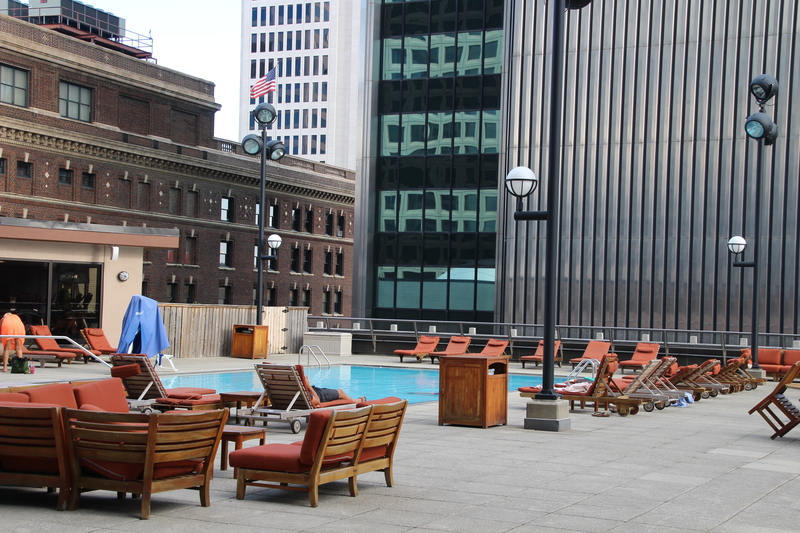 Some of the best the views of Downtown Columbus are from the rooftop of the Renaissance Columbus Downtown Hotel! Latitude 41, a Dean James Max destination restaurant, utilizes local ingredients to create delicious and unique meals. 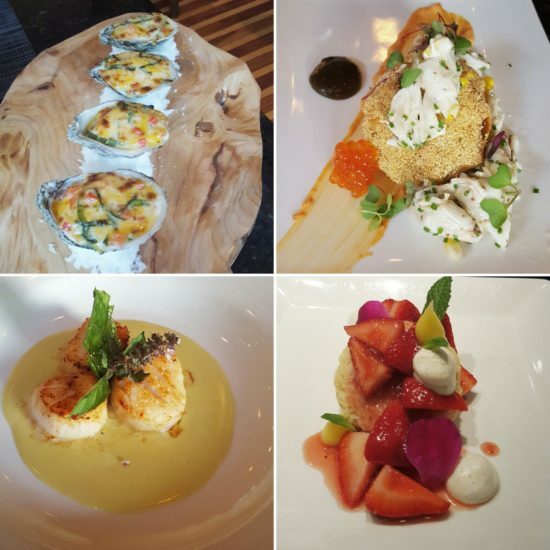 We were treated to a “tasting menu” prepared by visiting Executive Chef, Joseph Lerner, whose Virginia-roots created a southern inspired menu with five delicious courses. 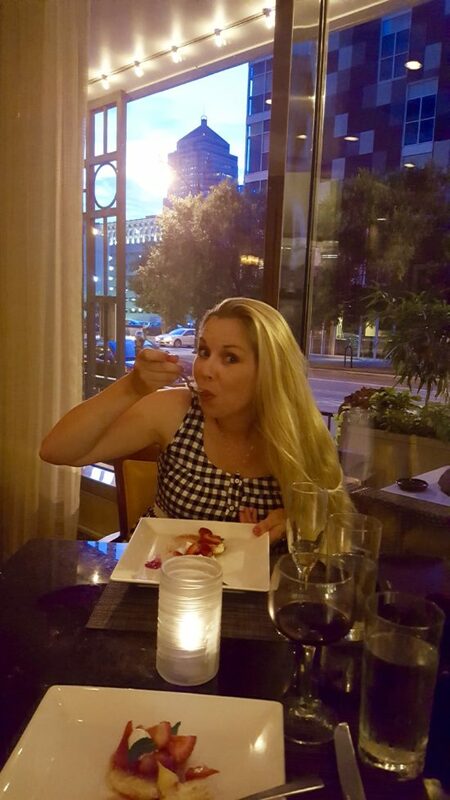 Each course was exquisitely plated and tantalized our palates! 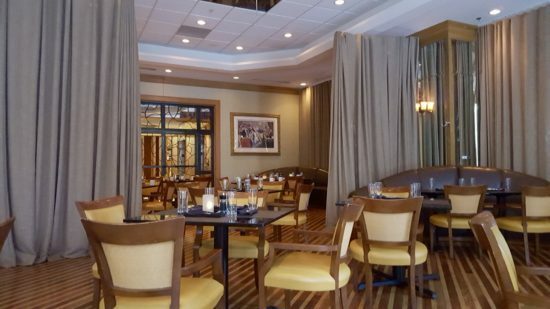 We had quite the dining experience at Latitude 41! After dinner we enjoyed a drink at Bar 41 while watching the vibrant city outside the large windows. It was the perfect place to end a lovely evening at the Renaissance Columbus Downtown Hotel! 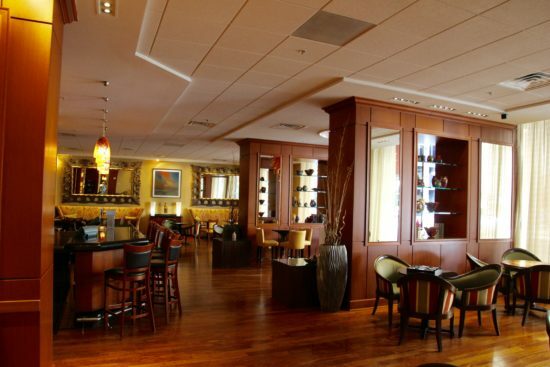 *Nearby the hotel is Mitchell’s Steakhouse, Tip Top Kitchen & Cocktails, Due Amici and Plaintain Cafe. All within a few steps of the hotel! Since the Renaissance Columbus Downtown Hotel is so welcoming and has a great restaurant and bar in the hotel, you could just stay there your entire visit. 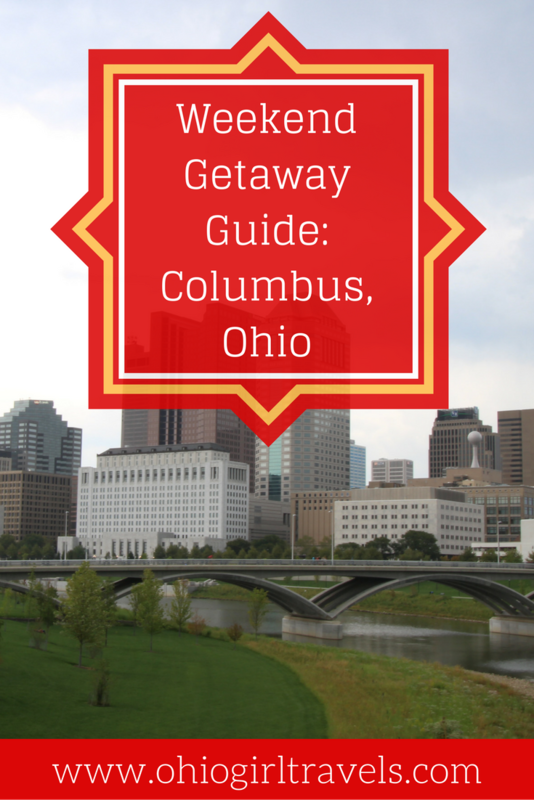 But with so much to see and do in Columbus, I would recommend visiting several local hot-spots! Columbus is well-known for great little neighborhoods, thriving art and fashion scene, delectable restaurants, eclectic bars and breweries and a coffee-lovers dream with loads of locally owned coffee shops! This historic neighborhood was initially platted in 1814 by German immigrants. 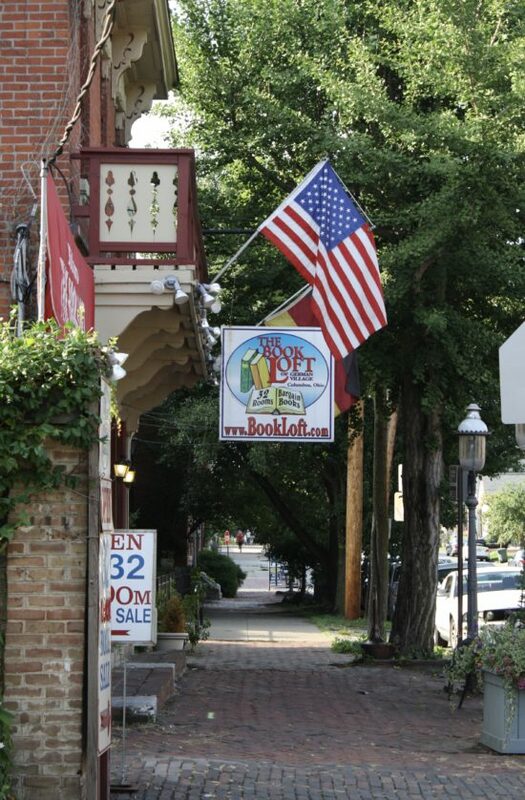 Thankfully, residents has preserved this wonderful slice of Columbus history, welcoming guests to stroll the charming cobblestone streets of this historic village! 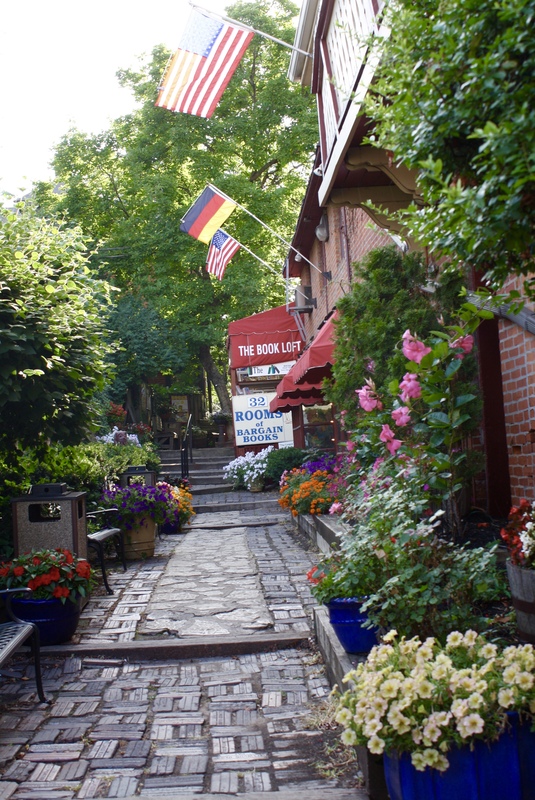 Favorite things to do in German Village are to visit Schiller Park, stroll the cobblestone streets and enjoy the facades of the historic homes, explore the thirty-two rooms of The Book Loft (my favorite bookstore in Columbus! ), dine at Schmidt’s (providing authentic German food since 1886), Thurman’s Cafe (the largest burger in Columbus), Easy Street Cafe, Dirty Franks Hot Dog Palace or Katzinger’s Deli, grab a sweet treat from Kittie’s Cakes (say hello to Linus, the owners’ adorable Golden Retriever) and enjoy a macaron and coffee at Pistacia Vera. *Looking for more historical places to visit in Columbus? Check out the Columbus Historical Society (located in COSI), the Ohio History Center & Ohio Village or take a tour of the Ohio Statehouse. 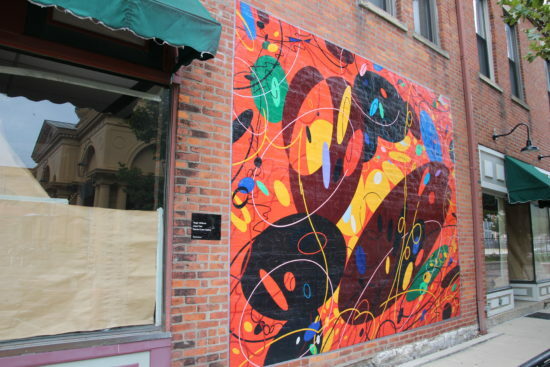 This vibrant, artsy neighborhood is re-defining Columbus’ art scene, with an abundance of art galleries, non-traditional art venues and street art found on numerous buildings throughout the district. 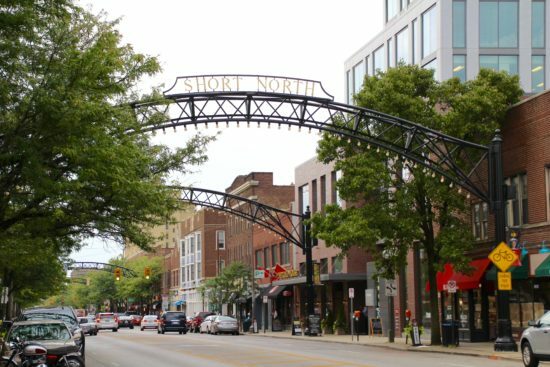 Favorite things to do in the Short North are to stroll the streets, gallery hopping, boutique shopping, explore Gooddale Park and visit the North Market (highly recommend a visit to North Market and its just a few blocks away from Short North). Numerous restaurants and bars are located throughout the Short North; some of my favorite restaurants are Bakersfield, Condado, Happy Greek, Hubbard Bar & Grille, Hyde Park, Marcella’s, Martini, The Guild House and The Pearl. Favorite bars in the Short North are Arch City Tavern, Brothers Drake, Denmark, Eleven, Mouton and Wine on High. 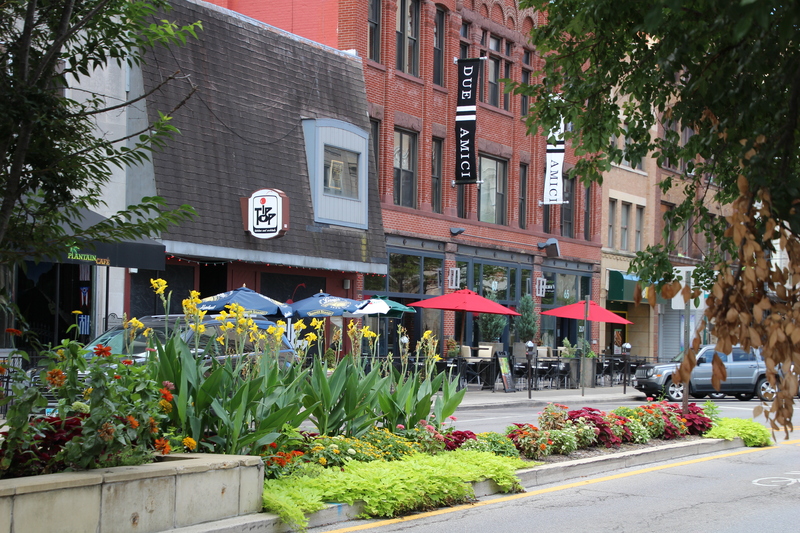 The Short North district definitely is the most vibrant area of Downtown Columbus! *Looking for more arts in Columbus? Check out the local art scene throughout Columbus at the newly expanded Columbus Museum of Art, Wexner Center for the Arts, Pizzuti Collection, BalletMet Columbus, Columbus College of Art & Design, Columbus Symphony, ShadowBox Live, CAPA (Columbus Association of Performing Arts), Ohio Theatre and the Palace Theatre. The Arena District is centrally located in Downtown Columbus, home to the Convention Center, Nationwide Arena and Huntington Park. This entertainment district is the perfect spot to catch a Columbus Clippers baseball game at Huntington Park, watch the Columbus Blue Jackets play hockey at Nationwide Arena, watch a live concert at Nationwide Arena or at EXPRESS LIVE! or enjoy dueling pianists at Big Bang Dueling Piano Bar. Favorite restaurants in the Arena District include Nada, Gordon Biersch Brewery Restaurant, Buca Di Beppo, BD’s Mongolian Grill and Ted’s Montana Grill. Local bars include A & R Music Bar, Big Bang Dueling Piano Bar, R Bar, Park Street Cantina, Brother’s Bar & Grill, Gas Werks and Bar Louie. 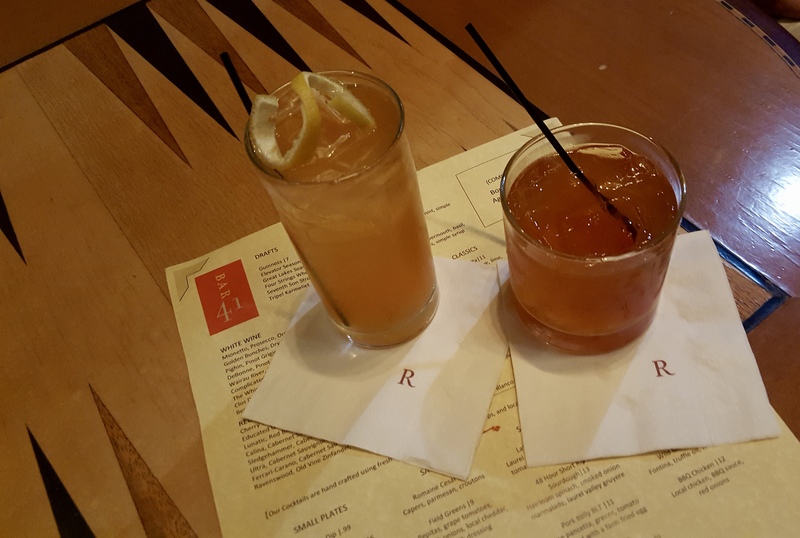 ~With so many places to see, amazing restaurants, vibrant bars, and caffeine induced coffee shops, a great way to experience Columbus is through one of many culinary tours and trails. 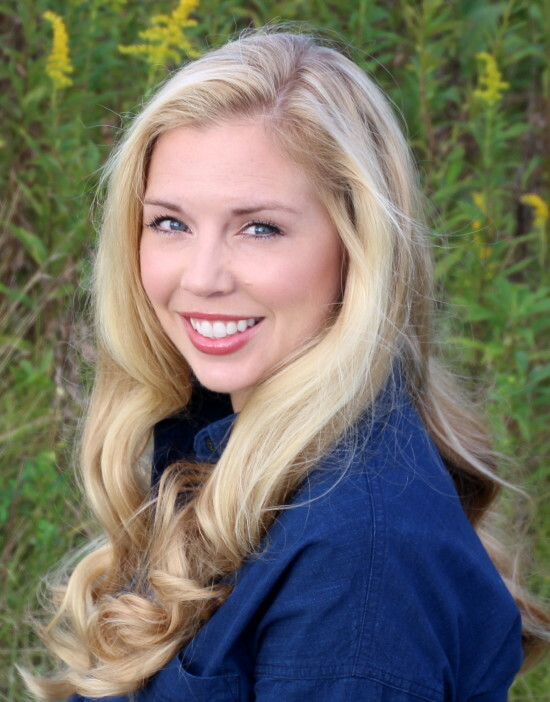 I would recommend a culinary tour with Columbus Food Adventures and a brew tour with Columbus Brew Adventures. Take a self-guided tour of Columbus’ coffee scene along the Columbus Coffee Trail or drink your way along the self-guided Columbus Ale Trail (just remember to drink responsibly and never drink and drive!). 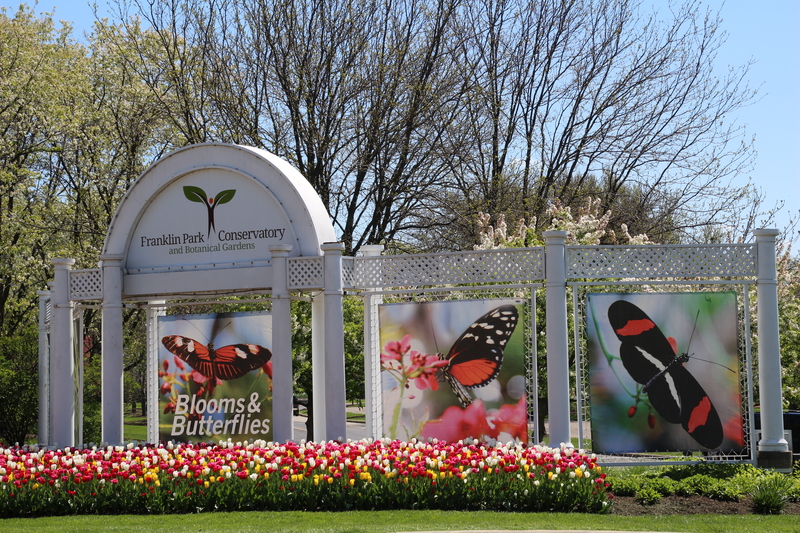 ~Other local attractions throughout Columbus are the Franklin Park Conservatory (one of my favorite places), Scioto Mile, COSI, Columbus Commons, Columbus Park of Roses, Columbus Zoo & Aquarium and the numerous Columbus and Franklin County Metro Parks. Visit my college alma mater, The Ohio State University, to stroll the beautiful campus and view gorgeous historic buildings, the large OSU campus feels like a city within a city! Also ask a local about their favorite neighborhood or suburb, we have lots of great cities and towns surrounding Columbus! With vibrant nightlife, thriving local art and fashion scene, world-class restaurants, local bars, fantastic boutique shopping and historical and cultural exhibits, Columbus will delight your senses, entice your taste buds and share its laid-back Midwestern vibe with you, luring you back to discover more of Ohio’s charms! 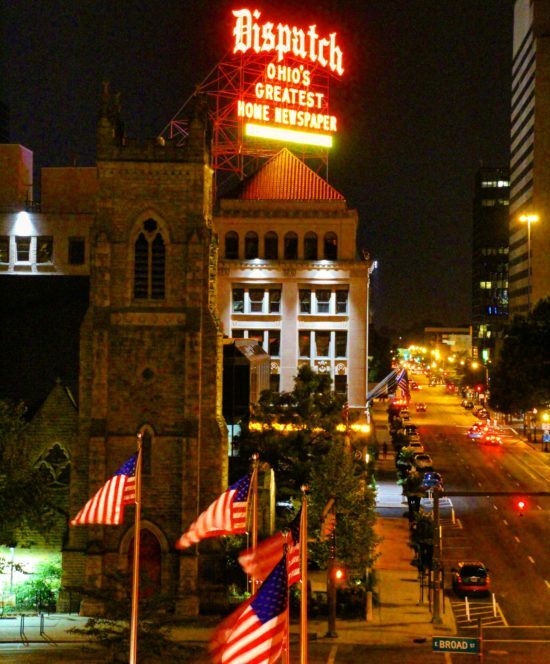 Where is your favorite place in Downtown Columbus? Let me know in the comments below! Love this post? Please share it! A special thanks to Renaissance Columbus Downtown Hotel, Latitude 41 and Bar 41! 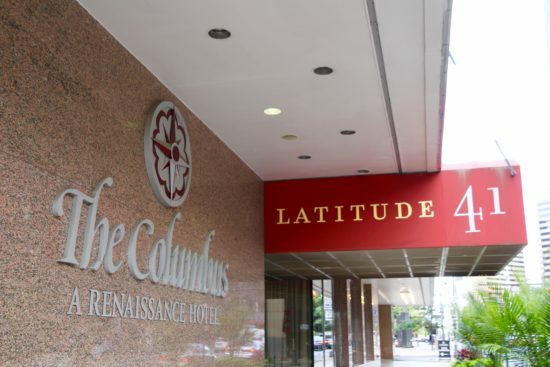 I was an invited guest of the Renaissance Columbus Downtown, Latitude 41 and Bar 41! As always on Ohio Girl Travels, all opinions are my own! North market . 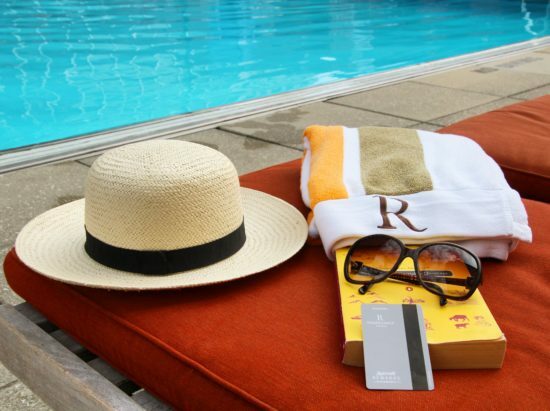 Would love to win a night away !